Koshari. Some love it, some think of it as carbs on carbs on carbs. It’s really fun picking up a local menu in a foreign language and trying to decode it. There’s no better reward for hard work than getting food. Also you know you’re getting cheaper food because it’s not a place with a khawaaga menu, with the prices inflated to reflect the effort they went into translating the menu, hiring servers that speak English and taking pictures. 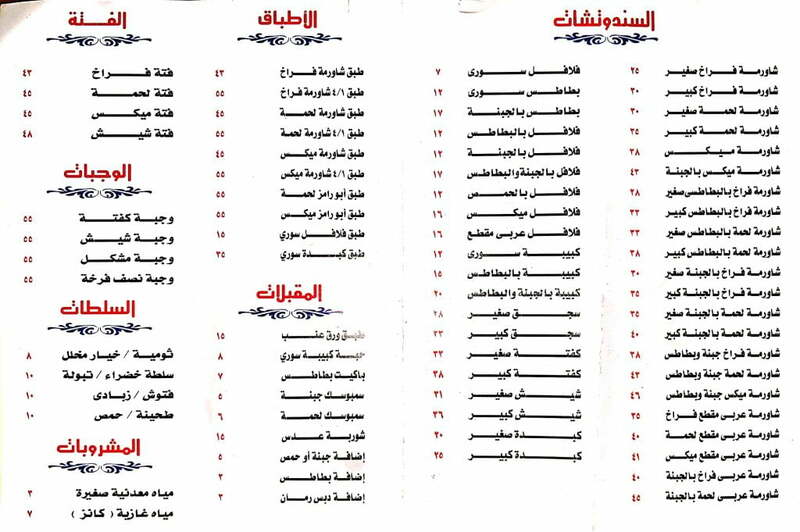 If you really want to get local in Egypt and understand local Egyptian food you have to read an Egyptian Arabic menu. Yes, it means you’re going to have to learn to read Arabic, but that won’t take you long. There are a few in here, some of them with text and some of them with a few pictures here and there. But that’s cheating. What do you do when you get to a place with an incredible smell wafting out of it, and see a menu that just looks like this? What does this menu say? 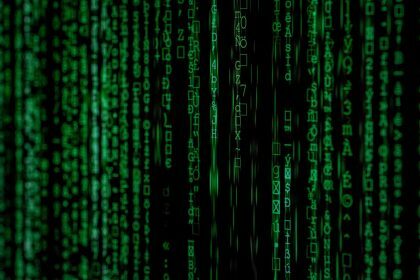 Let’s read on to figure out how to decode it. The minute I looked at this I knew that decoding it would unlock deliciousness of contemporary Egyptian cuisine. So how do I get past the code? This is what we do. The good news is there’s definitely an 80-20 approach to reading menus that works. 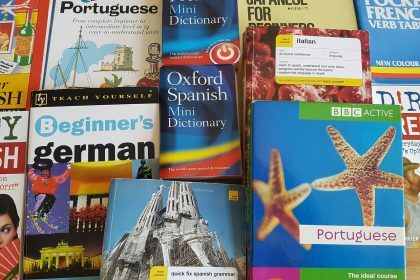 You don’t have to memorise boring lists of words that might be irrelevant — you only need to learn what you’re going to have to use! Your French textbook might teach you about expensive cuisine, but that’s no use if your daily food budget is 2.5 euros a day as mine was. I ate cheese and bread. To figure out a menu, just go pick a few up. Or take photos. First, look at the major headings. You’ve got to know those! Like the first time you go to Italy and figure out what “Primi” (entreés*), “Secondi” (main courses), “Paste” (pastas, NOT main courses), “Pizze” (no idea what this means) and so forth are, you have to figure out what the main categories are in the place you’re in. Then look for common ingredient patterns — words you see over and over again. These are the main ingredients you won’t go far without. Finally, you’ll have to order some food and ask them one key question: “What’s good here?” They’ll realize you’re foreign and order stuff for you. 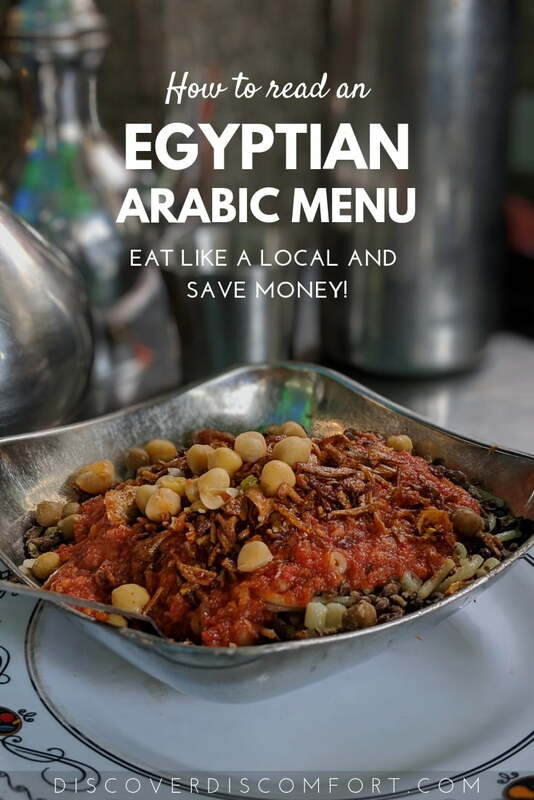 So let’s take an Egyptian menu apart and see what’s in it. * Americans use the word “entrée” to describe the main course, which in a country containing so many intellectual giants that have had such a huge impact on the world, is inexcusable. A ful w ta’meyya shop (lit: “Beans and Falafel”) is the most basic kind of eatery you have to understand to understand Egyptian local cuisine. 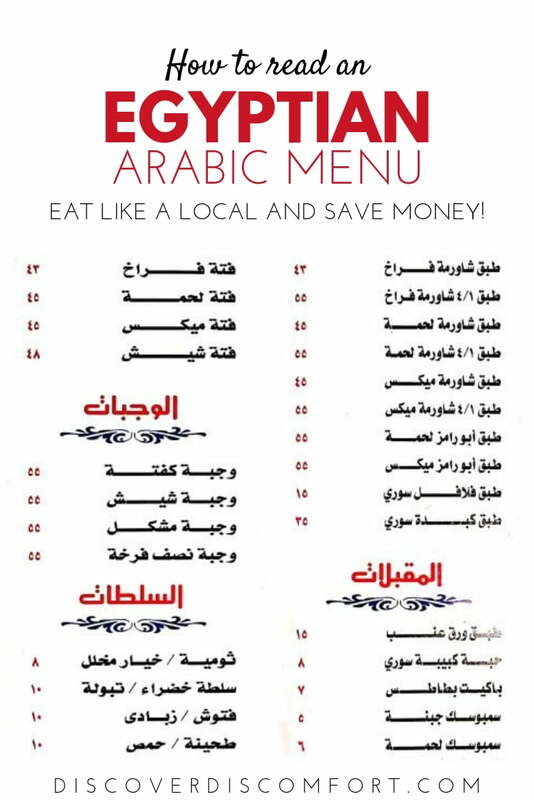 Most ful w ta’meyya places don’t have English menus, so you have to know Arabic to understand the menu. You’ll unlock cheap and delicious food. An entire meal for two from somewhere like this is usually under 20 LE, or less than one US dollar. The menu above from a photo I took outside the window as they had no menu inside. It is the first place we got breakfast in Cairo and we went back a few times. 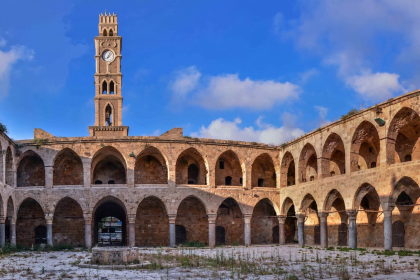 We thought maybe we had simple taste and liked any old place, but it turned out to be a local favourite! The name ful w ta’meyya is what you call a local shop that sells mostly those two things: ful (فول, fava beans) and ta’meyya (طعمية, fried spiced fava beans, like falafel). The shop is literally named after the main things it sells. 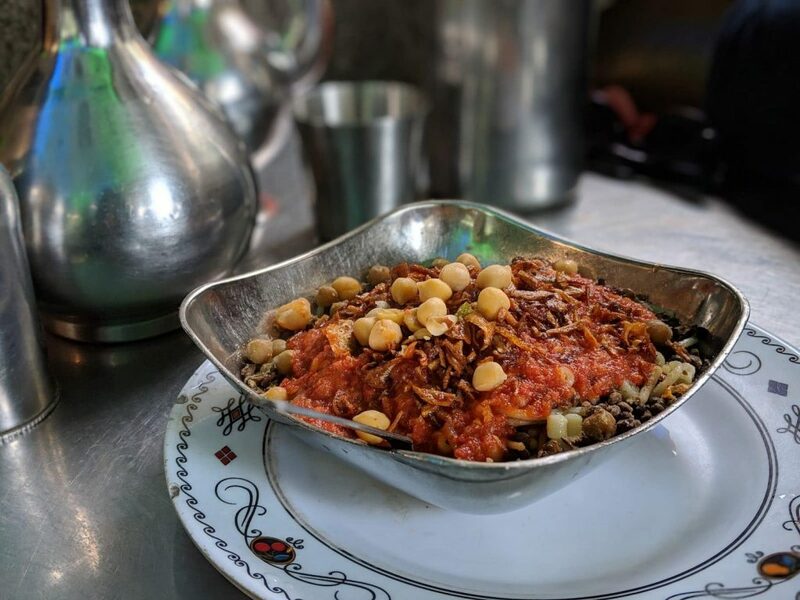 More on what ful and ta’meyya are later, but they’re a staple of everyday Egyptian cuisine. You generally get them as sandwiches in soft pita bread. There are just three sections in this menu. Note that the first one goes over two pages! السندتشات (as-sandwitchaat): Sandwiches. This is the core of this menu and many local eateries. In Egypt, a sandwich is any bread with any thing inside it. Definitely don’t expect it to be square bread. Sandwiches can be in either pita bread (aeysh baladi) or in delicious soft Syrian bread (aeysh souri). More on teh sandwich fillings later. العلب (al 3alab): Tins/containers. Here, you can buy containers of individual ingredients to take home and fed your family. This is a good option if you have bread and aren’t planning on eating on the run or dining in. It runs a bit cheaper. المشروبات (al mashrubaat): Drinks. There’s just water that’s gaseous and non-gaseous here. I think the gaseous water might be sodas. فول (ful): Fava beans. Usually mashed. Sometimes served with taHina (sesame paste, in case you’re not familiar), or straight. You eat this with bread. طعمية (Ta’meyya): Fried fava beans. kind of like falafel but gentler. باسطرمة (basTurma): Cured beef. Related to pastrami in name, but not the same. It’s really tasty, but unfortunately when you order it you only get tiny quantities, so don’t count on it for protein! باذنغان (pronounced bitingaan): Eggplant. Usually fried and served with olive oil and chillies. بطاطس (baTaaTis): This means fries. There are also a few other things that could mean fries on this menu, like something that reads as “pommes frites” which I didn’t try, and also “shibs” which I did try and means like chips you get out of a packet. بيض (beyD): Egg. This can come a number of ways, like مسلوش (masloo’) (boiled), or omelet, which I prefer because it’s super easy to remember (and tasty). شجق (sugu’): Sausage. A fatty and flavoursome beef sausage. علبة (a3lba) and طبق (Taba’): Container/plate. This is to describe containers in which you can store things you buy. قرص (‘arS): One “unit” of ta’meyya. It costs 0.5 LE here, so for a quarter dollar you can get enough to get sick on. It means… one medallion? One entity? I don’t know the meaning of the word. The varying meanings from the dictionary include “bite” which sounds best. When you order these things, you’ll get them in sandwich format (unless you get a little container). You’ll find, of course, that the ordering process doesn’t quite make sense. You order with one person, then get a ticket, but then have to talk to another person anyway who won’t quite understand you or the ticket. Sometimes I’d order directly with the person making the sandwich, and he’d do all kinds of extra things. The same order will result in different prices and different things on different days. Sometimes they throw in extra things and sometimes not. It’s all a bit random, but you have to roll with it. The easiest thing to do is order off the menu. Unfortunately, we discovered that our favourite mix was ta’meyya, eggplant, egg and salad in one sandwich which is NOT a standard sandwich. Well, it should be. 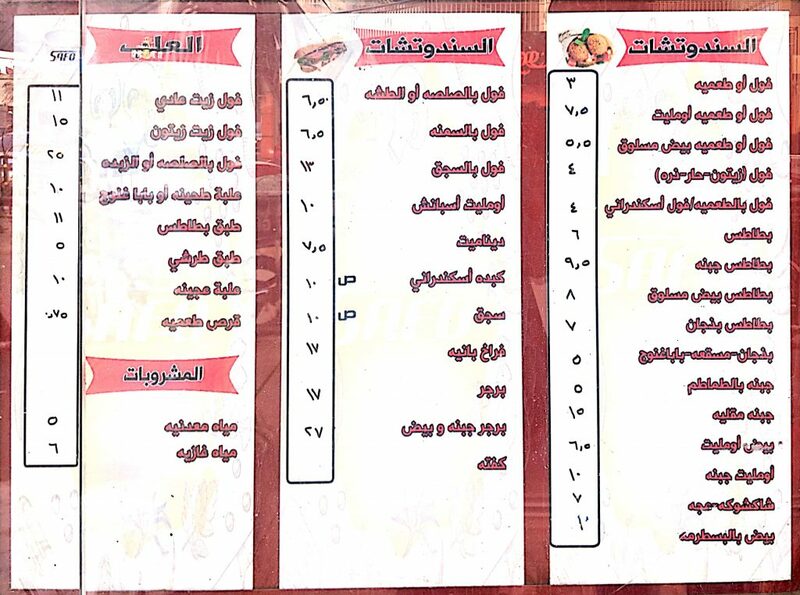 A Shawerma menu is the second most common kind of menu you’ll see around Egypt. Shawerma is a little more expensive. 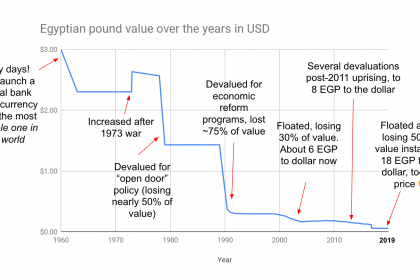 You typically will spend about 20-35 LE on a shawerma sandwich, no matter what part of town you’re in (even downtown). When you remember that the local workers think of an LE roughly the same way Europeans think fo a Euro or North Americans think of a dollar, you realise that’s a lot. This was the menu of a place we went to for dinner. We had no idea what we were doing and were starving. The shawerma was the best thing I had tasted in a long time. I also like this menu because the layout lets you isolate key words that repeat a lot easily. الاطباق (aT-Tabaa’): Plates. This is where you buy a ton of meat. Meat is sold by the kilo here, or in quarter-kilo portions. Typically a one-person serving is a quarter kilo (or roughly half a pound), which is written as ١\٤. It’s very hard to read that. I once read it as “a third”? I’m sorry, the 4 looks like a 3 to my khawaaga eyes. But believe me, it’s a quarter kilo. المقبلات (al moqabbalaat): Side dishes/entrees. These are the usual suspects in Egypt of stuffed grape leaves, fries, sambuseks, soup, and additions to meals. الفتة (al fatteh): Fatteh. This is a dish of crispy bread and rice with the meat on top. A word of caution: usually the bread is soggy when you get it. It’s best to have this fresh and from a place that does it well. الوجبات (al wagbaat): Meals. As above. A wagbah at a simple eatery typically means you get your dish of meat, plus rice, bread, a couple of “salad” things and sauce. السلطات (as-salaTaat): Salads, but not exactly. The word “Salad” here includes garlic mayonnaise (toumeyya), a standard vegetable salad, yoghurt, and tahiina with hommus. On one menu I remember “fried bread” was under the “Salad” menu. It basically means “non meat side dishes”. Now, continuing with the 80-20 approach, let’s look at patterns of words we see repeating often in the menu. Fortunately, the typography of this menu makes it easy. Of course, the stars of the game are going to be the kinds of meat you can get here, of which there is “chicken” and … “meat”. شاورمة (shawerma): A “Shawerma”. This is the staple wrap. You might know it as a shawerma, or as doner kebab, or as a kebab. It’s meat with a sauce wrapped in bread (hopefully deliciously soft “syrian” style bread, but it could also be Egyptian country-style bread, or a bun). فلافل (falafel): Falafel. This could mean fried chick peas (real falafel), or might be actually just a different word for Ta’meyya, or fried fava beans. فراخ (firaakh): Chicken. 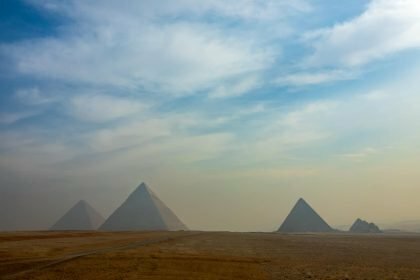 This is a place where Egyptian differs from Modern Standard Arabic. Sometimes it says دجاج (djaaj) on the menu, the MSA word, but you still say firaakh. لحمة (laHma): Literally “meat”. In Egypt, meat means beef. If it’s lamb, they’ll specify with لحمة ضاني (laHmit Daani). Same with other kinds of meat, which are more rare. كفتة (kofta): Kofta, or minced meat on skewers, usually small and about the size of your thumb but three times the thickness. It’s hit and miss, but often quite tasty, just a little dry from being overcooked. كبير/صغير (kbiir, Sughayyar): big and small. Just get a big. These guys know their pricing well. The big is usually only slightly more expensive than the small. ميكس (miiks): The “Mix”. Ah the “mix”, usually meaning a mix of whatever the two mains of meat are. In most cases it means kofta and kebab. Sometimes, if a mix is present, nothing else is available. They just try to sell you mix all the time. شورى (souri): Syrian bread. It’s a soft, thin and malleable bread that you have to try. جبنة (gibna): Cheese. Means soft white cheese normally. كبيبة (kobiiba): Like croquettes. Fried bulghur wheat balls with meat inside them. These words already get you through most of the menu, including the dishes (which are all based on meats), the fatteh and the wagbaat (meals). Have a look! ورق عنب (wara’ 3inab): Stuffed grape vine leaves. Known as dolma in other parts of the Mediterranean. اضافة (aDaafa): Additional. Additional chips, cheese etc. ثومية (toumeyya): Garlic sauce. Based on garlic (toum), this is basically like mayonnaise in that it is made of olive oil and very high in fat. It’s applied liberally to most shawerma sandwiches. It’s infectious. Beware! زبادى (zibaydi): Yoghurt. This is the word in local Egyptian dialect. طحينة (TaHina): Tahini. Or, as you might know it, “Tahini”. حمص (Hummus): Hummus. It’s exactly hummus. Pro tip: For appetisers, you can just assume what they have and order it. Want some wine leaves and some eggplant in a container? Ask for it. You’ll get it. This is definitely a non-traditional menu, but it’s a place we ended up going to fairly often because it was close to home. This restaurant had two bars inside it. On one side was all the ful and ta’meyya stuff. On the opposite side there was a grill and fryer, where they prepared kebab, chips and so on. We called it “fight club” because of the brawl we saw break out there on day one… but that seemed to be an outlier case. The food was delicious and the service was very welcoming. It combines a bit of both of the above, plus adds in a couple of extra things, like crepes. Let’s look at the headings, then at major words in the menus. الفول والفلافل (al ful w al-falafel): Beans and falafel. This is the core of the menu. It could also have been called “Sandwiches”, because that’s how this food will come. 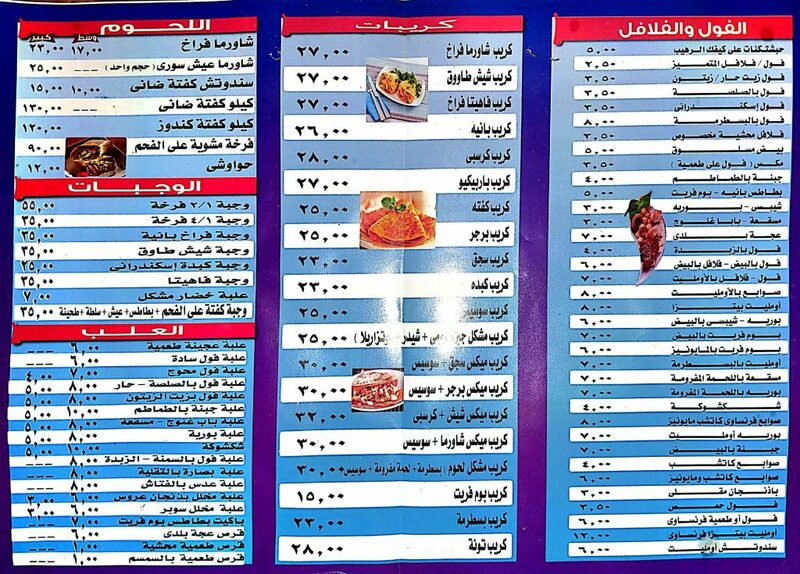 On this menu it calls ta’meyya فلافل (falafel), which means it’s an Alexandrian style restaurant. Same thing though (still fried fava beans). Here you see prices from 2.5 all the way up to 12 for varying kinds of sandwich. For example, 2.5 gets you either a ful or falafel sandwich. The price of 4 LE gets you a cheese and tomato sandwich. Fancy! Or 8 LE gets you a fuul and basturma (pastrami) sandwich, for a bit of meat. Sometimes the basturma comes in egg. كريبات (krayb). Crepes. “Crepes? Get away from me, foreigner!” Actually this is a reasonably common snack around Cairo, not just for tourists. They’re more expensive. The first one on the menu is a chicken shawerma crepe for 27 LE, which is a lot of money to people. اللحوم (al-lahoom): Meat. You can buy meat here, either in shawerma format or just large amounts of meat. 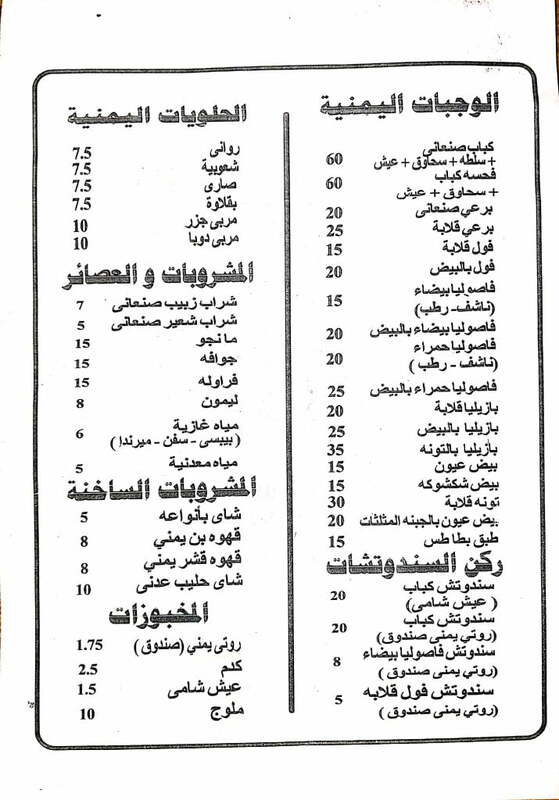 See the fourth item: for 140 LE you can get a kilo of kofta. Actually reasonable value. الوجبات (al wagbaat): Meals. A wagba, or “meal”, is usually a combo (also a word that’s used) of meat, beans, bread, dips/salad and rice. The first one on the menu is a half chicken meal for 55. You can bet the chicken will come on rice, be served with a bunch of bread and come with hummus/tahina and a small salad on the side. Maybe even fries! على كيفك (a3la kayfak): As you wish. It’s in the first food item. This basically means: we’ll make things however you want it. 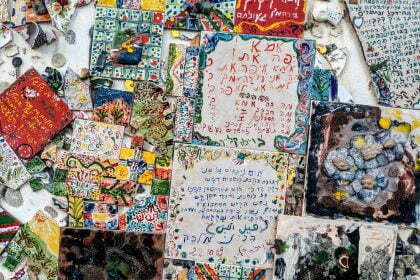 مشكل (moshaakel): Mixed. Another way of saying mixed. Mixed meat, mixed vegetables etc. كبدة (kibda): Liver. Liver often comes as kibda iskandiraani, or Alexandrian-style liver. I don’t ever lust over liver (it’s like eating a car’s oil filter), but I kept seeing it being cooked and eventually tried it. From a good place, it can be amazing. كفتة ضاني (kofta Daani): Lamb kofta! As promised above, when it’s lamb (and not beef), they’ll specifically mention it. Lamb is more expensive. حواوشي (Hawawshii): Fried meat bread. Not sure how else to describe it, but it’s basically a burger patty in bread that’s fried. It’s quite deadly. There are many other dishes and types of food we haven’t covered here that are common in Egyptian cuisine. Tajins (or tagen as they’re called here), koshary, stuffed peppers and okra (mashwi), sweets (Halawiyaat) and coffee (‘ahweh). We’ll publish guides to some of those later, definitely at least coffee and sweets. In Egyptian Arabic: اي احسن حاغا عندكم؟ eh ahsan haga 3indkum? Hope you get to find out.